Another Earth's science-fiction element is moderately self-explanatory: a recently-discovered second world, just like ours, exists within a distance to Earth that's close enough to travel. In the realm of indie cinema, filmmakers often go small-scale when handling something like this to purposefully tiptoe around budget-sapping set pieces or glitzy visual effects, instead holing up in the weighty drama that thrives in the scope they're able to achieve. Writers Make Cahill and Brit Marling clearly relish their boundaries as they operate under those parameters, where a scientific oddity seamlessly integrates into our known world as both a curiosity and a vital narrative element. What they've created is robust, assertive personal storytelling that uses its outer-reality concept as a pivot point for musings on regret and the healing power -- and damaging effects -- of social isolation, as well as an ample source of metaphysical contemplation behind a second, potentially human-inhabited world. The filmmakers at the core of Another Earth wear several hats during the production, as is normally the case for indie projects: Director Cahill doubles as cinematographer, giving the film a harsh but compelling and intimate vibe, while Brit Marling's acting chops bring the central character, Rhoda, to life. After serving four years in jail for manslaughter due to a drunk-driving accident that killed all but one family member in the opposing car, Rhoda reemerges as a shell of the girl she was when she went in. Once a prospective college student with an eye for astronomy -- a radio broadcast about the newly-discovered planet was the distracting catalyst to her wreck -- she now elects to work remedial cleaning jobs that keep her away from people, yet she can't avoid hearing about "Earth 2" and a writing contest that will send one deserving person to the planet. Haunted by her mistakes, she considers the possibility of leaving this earth and going to the other, but not without revisiting her past beforehand. Cahill and Marling don't shy away from the science-fiction elements in Another Earth, even if it means exposing their story to gaps in logic as they construct their big picture. The real head-scratcher, a large one, comes in the swift discovery of another planet that's of identical properties -- resources, atmosphere, even people -- to Earth's, a place within travelable distance that astronomers haven't stumbled upon until now. The pair of writers sells the idea though, thoroughly, and the meditative perspective they create around the planet's discovery compensates for that, namely with starting a new life in a place that's almost exactly like Earth's and what the mirror planet's thinking in terms of cordial communications or volatility. Perhaps Earth 2's quick emergence is something more ethereal and divine, something that the story offers a hint towards later on. There's interpretation to be found in the script's viewpoint, without question, and it's compelling and ambitious enough to leap-frog plot holes. 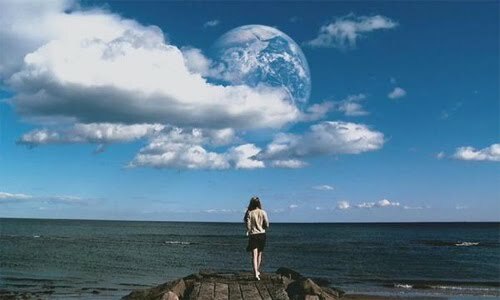 Another Earth's reflection on the science of dual worlds provides the environment for Rhoda's melancholy journey towards rediscovering normalcy, not merely the film's pure thrust. Cahill and Marling are more interested in her psychology and the choices she makes once she seeks out the remaining member of the family she killed -- the father (LOST's William Mapother), an ambitious composer who has all but dropped off the face of the earth after awaking from his coma, who has no idea of Rhoda's identity. In lesser hands, the dramatic developments that ensue might've felt inauthentic and far-fetched, but Brit Marling's captivating, barefaced presence elevates them to a haunting level that allows us to ignore any doubtfulness and instead embrace the raw, tough emotional context. Marling navigates the guilt Rhoda feels over her transgressions and, ultimately, conflict over her semi-anonymous companionship with John with an evocative poise that's well beyond her years. Emotional heft becomes the impetus driving Another Earth, which smartly explores the philosophical connection between a mirror-image Earth and the prospect of running away from one's mistakes. Subtle dramatic developments between Rhoda and John in the walls of a dark, dreary house render the film quietly harrowing, with Cahill's direction and photographic eye emphasizing the narrative's quaintness through self-assured, hushed close-ups that encompass them in deftly-felt human energy, gloomy as it may be. Once it reaches a somewhat alarming middle-point, where, after an attempt at radio communication, the truth comes out about what (and who) inhabits Earth 2, the way it provokes thought about the nature of remorse and second-chances escalates its melodrama to a mysterious and potent stratosphere. There's complexity at-play within Cahill and Marling's intimate exploration of the unknown, of both mental and dramatic types, that skillfully creates a convoluted emotional testing ground within the gravity of stripped-down science-fiction.